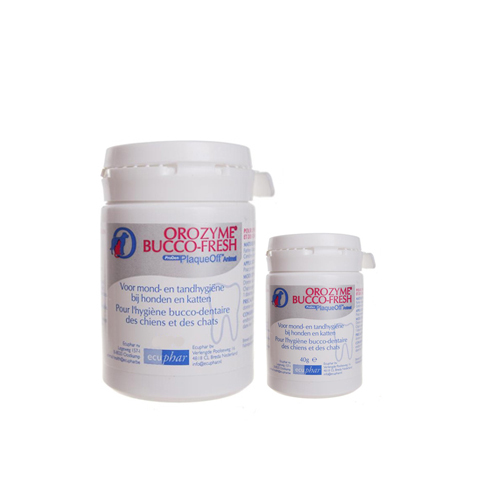 Orozyme Bucco Fresh PlaqueOff is an innovation in the fight against bad breath. It also improves the condition of gums and teeth in dogs and cats. When a dog or cat's teeth are neglected, they can lose teeth. What's worse, dental problems can have an adverse effect on your dog's health. Plaque is a barely visible layer that constantly forms on the teeth. It consists of food particles, mucus and bacteria. If it is not removed, plaque turns into tartar. You can help your pet by removing plaque, but tartar can only be removed by your veterinarian. Orozyme Bucco Fresh PlaqueOff is an innovation in the area of improving bad breath and keeping dogs' and cats' teeth and gums healthy. Orozyme Bucco Fresh PlaqueOff helps to prevent the plaque from sticking and lifts off the sticky layer. You should see an improvement in the condition of your dog or cat's oral and dental hygiene after a few weeks of treatment. Orozyme Bucco Fresh PlaqueOff prevents plaque from forming on the teeth and reduces the effect of existing plaque. Improvements can be noticeable after three weeks of treatment: bad breath disappears and the condition of the gums improves. This is the first sign of improving oral and dental hygiene in your dog or cat. While using Orozyme Bucco Fresh PlaqueOff, it is helpful to give your dog Orozyme RF2 Sticks every day or every other day. The chews will soften plaque, which helps to remove it. Orozyme Bucco Fresh PlaqueOff is a 100% natural supplement made from a special type of algae. The ground powder is easy to add to dry or wet food. The powder has a very low calorie content, making it suitable for cats that are overweight. The strips are low in calories: Small 28 kcal, Medium 35 kcal and Large 53 kcal. Have you used Orozyme Bucco Fresh PlaqueOff before? Let us know what you think about this product.